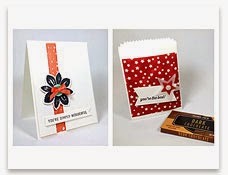 Stamp with Melva: Amazing Products from Sale-a-Bration ... and the best part is they are free! Amazing Products from Sale-a-Bration ... and the best part is they are free! I wanted to share some of the amazing rewards that you can get for free with every $60 purchase during Sale-a-Bration. Have you ever heard those commercials on television "It's the most wonderful time of the year"? Well for me, Sale-a-Bration is the most wonderful time of the year and you have until March 31st to take advantage! Here's some cards that used the "A Happy Thing" Stamp Set (Item 139134). My last blog posting showed a couple of other cards that I made using this same set. 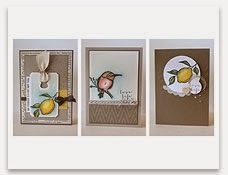 I was focusing on the lemon stamp, but here's a sample of the very cute bird! You don't want to miss out and to make it even better, starting on Monday, March 2nd Stampin' Up! is adding some amazing bonus products that you can choose from. Again, for every $60 you spend you select one free reward. Email me to get your catalogues - the Occasions Catalogue, the Annual Catalogue or the Sale-a-Bration catalogue. You can also look at them online by clicking here. Once you've had a look, you can either order online or contact me with your order.